Healthy and delicious. Just sprinkle in your ideas and Somen can be a real treat! Add some fruits and vegetables of the season, mix with seafood and seaweed with appetizing sesame sauce, or cook it like Italian spaghetti for a voluminous dish. Matches perfectly with a spicy hot tomato sauce, or with your children’s favorite curry flavor! Served hot with toppings and garnishes of your choice – Somen can be cooked in any flavor that you desire. What will be on your menu today? 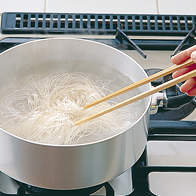 Place three bundles of Somen into a large pot filled with 8 cups of boiling water, and then quickly stir with chopsticks. 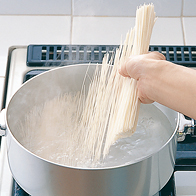 ※Boiling the noodles in soft water results in the best flavor. When the water reaches a boil, adjust the heat to a simmer. Somen is ready when it becomes semi-translucent (approx.1 1/2 to 2min.). 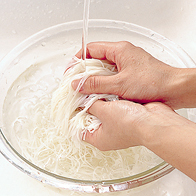 Allow the boiled somen to cool in a draining basket with running water and then wash well by rubbing the noodles. Drain thoroughly. 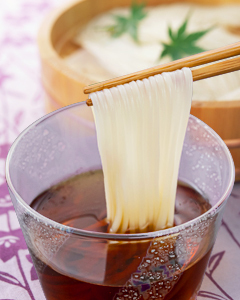 Thin Somen goes perfectly with dipping sauce. Firmness is maintained when boiled – Ideal for simmered or stir-fried foods. Going down smooth, Somen is perfect for all occasions. 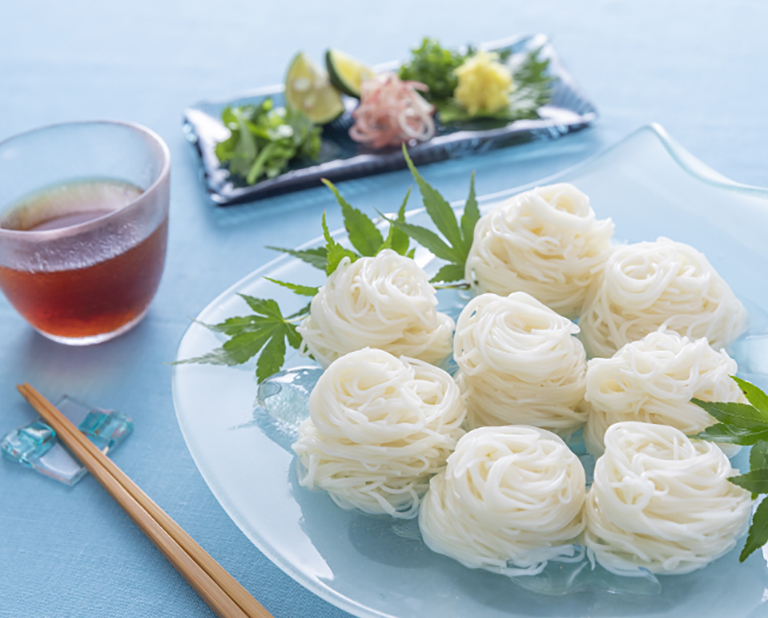 The sight of white, lustrous Somen stimulates your appetite. Hand-stretched Somen is tasty down to the last bite.